Here's just a small selection of some of our more recent projects. Click on image to view before & after. All exterior wood work on this large property was prepared and repaired to a very high standard with additional Joinery work on the front porch by one of our close contacts. Wood work is finished with Permoglaze brilliant white undercoat and gloss. This work on this property entailed preparation and painting of stain treated wood cladding, moulding replacement on gable end, fascias and soffits repaired, prepared and painted and complete removal of guttering and downpipes then replacing with new. This wing of the property had oak fascias, soffits and beams repaired and stained with appropriate woodstain. Masonry work was prepared and repaired before receiving x 2 coats of Dulux Trade weathershield masonry paint. Bedroom Walls stripped of all paper before being repaired, sealed and painted. Woodwork prepared and filled then finished with Dulux Trade undercoat and gloss. This pretty cottage had all unstable paint removed and exterior walls repaired and stabilised prior to painting restoring it to its former glory. 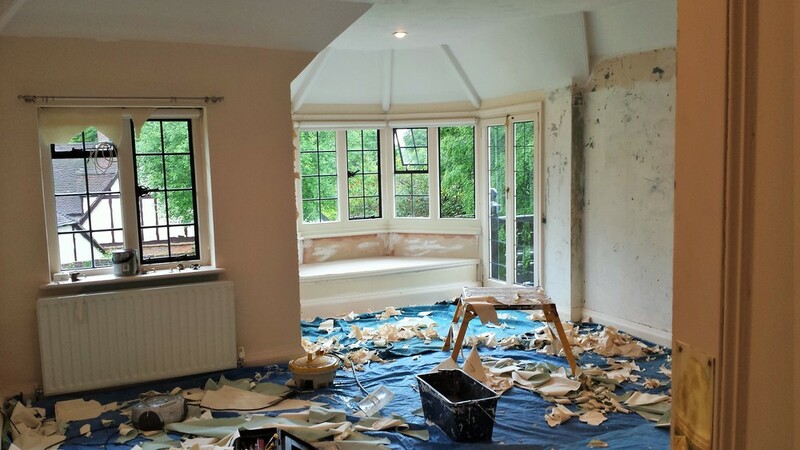 This room was completely overhauled with removing old paper back to bare wall then repairing the existing walls, a 1400 grade lining paper was then hung horizontally before new Laura Ashley paper was hung. All existing wood work was prepared and filled to a high standard and finished with Dulux Trade brilliant white undercoat and gloss.Dulux Trade brilliant white undercoat and gloss. All woodwork was prepared and filled before appropriate MDF primer was applied, the woodwork was then fine sanded between coats and all paint applied with mohair rollers to give a superior paint finish. The wardrobe designed and built out of pine. All woodwork was prepared and filled before appropriate primer and knotting was applied, the woodwork was then fine sanded between coats and all paint applied with mohair rollers to give a superior paint finish. 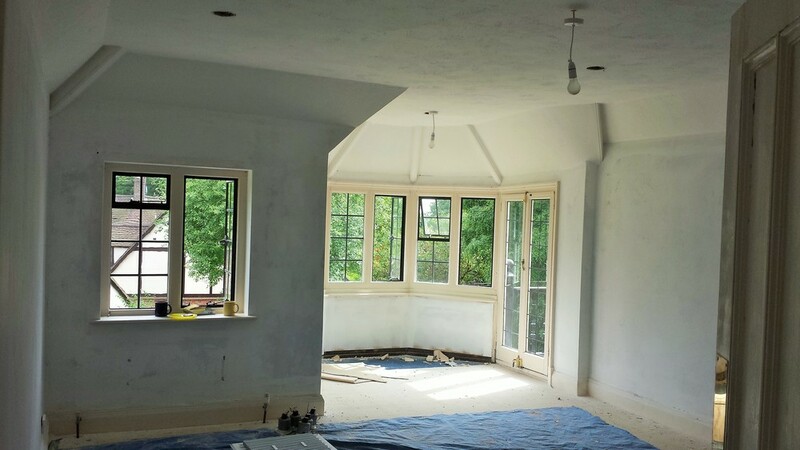 A sample of before and after pictures showing the preparation process through to the finished article.